By Sean Jones: Trainer Freddie Roach says Keith ‘One Time’ Thurman is his #2 choice for Manny Pacquiao’s next fight if they can’t get a rematch with Floyd Mayweather Jr., which appears to be the case. Pacquiao (61-7-2, 39 KOs) has heard no word from Mayweather about him wanting to come out of his two-year retirement to fight him in a rematch. Getting WBA Super World welterweight champion Thurman (29-0, 22 KOs) to agree to a fight against Pacquiao will be as easy as pie. Thurman, 30, wants the fight against Pacquiao in the worst way, and made that clear before and especially after his warm-up level fight last Saturday night against fringe contender Josesito Lopez (36-8, 19 KOs) on Premier Boxing Champions on FOX and FS1 from the Barclays Center in Brooklyn, New York. Thurman told the fans after the fight that it would be an honor for him to share the ring with the 40-year-old Pacquiao. Since both of them are with PBC, it’ll be a snap to put the fight together. Pacquiao prefers to fight Mayweather, cause that’s the bigger money match-up for him. Pacquiao also would like to face the winner of the Errol Spence Jr. vs. Mikey Garcia. Thurman might be a bigger fight for Pacquiao, however, being that he’s a little more verbal and outgoing than Spence Jr. and Mikey. Thurman makes a lot more noise in the media when it comes to promoting his fights. Thurman has a gift for gab, and he’ll work hard to sell a fight between him and Pacquiao, knowing that it’ll help his career, as well as bring in more pay-per-view buys on FOX or SHOWTIME. It’s entirely possible that the 41-year-old Mayweather is playing coy with Pacquiao to feign indifference before pulling the trigger on the fight, but it could be that he really doesn’t want the fight and doesn’t care that he’s walking away from $100 million payday. Mayweather seemingly doesn’t care that he’ll miss that money, and possibly regret it one day. Right now, Mayweather is doing his own thing. Pacquiao will have to follow Thurman around the ring if he takes the fight with him. Thurman moves around a lot, and he’s not going to stand and make it a fight. 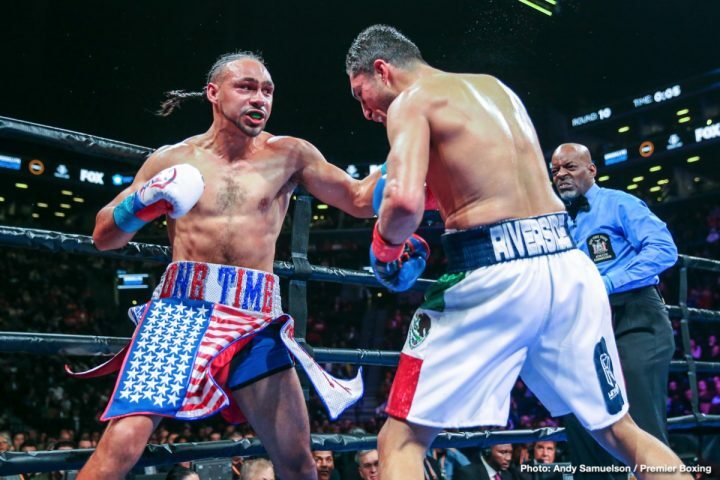 Against Lopez last Saturday, it was boring to watch much of the time due to Thurman trying to get away from his pressure in the second half of the fight. Thurman can make it boring when he gets tired or when he’s hurt, like he was last Saturday. Thurman fought the same way against Danny Garcia when he got tired in the last six rounds in their fight in March 2017. The way that Thurman looked last Saturday against Josesito Lopez may have cemented him in as Pacquiao’s next opponent. Thurman looked vulnerable throughout that fight, and was almost knocked out in the seventh round by Lopez. Thurman eventually prevailed in winning a 12 round majority decision by the scores 113-113, 117-109 and 115-111. Thurman didn’t look nearly as impressive in beating Lopez as guys like Marcos Maidana, Saul Canelo Alvarez and Andre Berto did in knocking him out. If Thurman had looked sensational last Saturday night against the 34-year-old Lopez, would Roach still want him as Pacquiao’s Plan-B opponent if Mayweather doesn’t fight him again? Probably not. Roach wants Pacquiao to fight guys that he can beat, and Thurman looks beatable right now after his off performance against Lopez. Thurman didn’t look much better in his fights against Danny Garcia and Luis Collazo. Thurman was hurt by Collazo, and almost dropped. Thurman was also hurt by Diego Chaves and Jesus Soto Karass. Thurman’s punch resistance has never been good, but he was able to cover up for that vulnerability with his speed and footwork. Now that Thurman has slowed down a notch due to age and inactivity, he’s now showing how vulnerable he is. Lopez is a fighter that would have likely been destroyed by the likes of Errol Spence Jr., Shawn Porter, Terence Crawford and Danny Garcia last Saturday night. Mayweather sounds like he’s going to stay retired, and walk away from the money that he would get from a second fight. It doesn’t make sense for a person to walk away from that kind of money, but that’s Mayweather. Pacquiao will need to make the decision to fight Thurman or the Spence-Garcia winner next. Thurman looked like he’d aged badly in his last fight. The two years that Thurman has been out of the ring haven’t done his boxing skills and chin any favors. Perhaps it’s just rust that was cause of Thurman looking like that. It’s more likely that Thurman has aged, and he’s not going to get back to the level he was at before. Thurman’s game is based on speed and movement, and those type of fighters don’t do well when they hit their 30s, and start to lose speed and mobility. “No, we haven’t heard nothing yet. But, you know, we have to let them say it — just like last time. You know the drill. But, you know, he is the star though,” Roach said about Mayweather not having said anything about wanting to come out of his two-year retirement to fight Pacquiao. Mayweather probably won’t come out of retirement unfortunately, and Pacquiao cannot wait for the next four months, hoping that he’ll take the fight with him. Pacquiao’s management will need to setup his next fight in a month or so in order to start getting the boxing public excited about it, be it Thurman or the Spence-Garcia winner. Mayweather will probably resurface in a year or two, fighting another MMA with no boxing background in order to try and sell another mismatch to the fans. Mayweather will soon find out that he’s getting diminishing returns for his fights against MMA guys, and he’ll need to make a decision whether to start fighting boxers again or stay retired. It would be in Mayweather’s best interest to make that decision now rather than waiting to get older. The longer Mayweather waits, the less popular he’ll become. The fans aren’t going to want to pay to see an old guy in his mid-40s, who they barely remember, fighting Pacquiao 2 to 3 years from now.